Background and Objective: Asenapine is an atypical antipsychotic approved by US Food and Drug Administration in 2009 and by European Medicines Agency in 2010 for Schizophrenia and Bipolar Disorder treatment. Currently, many studies have been developed in an attempt to clarify and minimize the risks related to the use of psychotropic during pre/postnatal period on patients with a history of mental disorders. Conclusion: The aim of this study was to test the impact of pre and/or postnatal exposition to asenapine on mice offspring behavior. Four groups of animals, previously treated with a dosage equivalent to 50% of the bioavailability obtained with a 20 mg daily use for human treatment, were exposed to the Open Field and Elevated plus Maze test. Only the group exposed to asenapine during both pre and postnatal periods showed response difference in the Elevated Plus Maze test, which was restricted to urination. 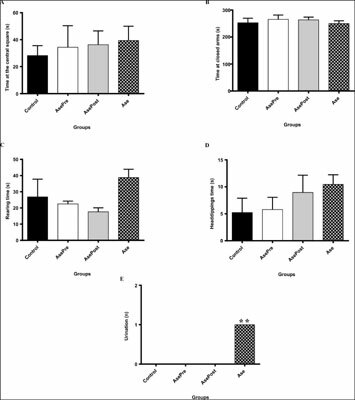 However, our data suggest that the administration of asenapine does not induce significant anxiety-like behaviors in mice. Keywords: Antipsychotic, schizophrenia, bipolar disorder, behaviour, anxiety, stress, open field, elevated plus maze. Keywords:Antipsychotic, schizophrenia, bipolar disorder, behaviour, anxiety, stress, open field, elevated plus maze. Abstract:Background and Objective: Asenapine is an atypical antipsychotic approved by US Food and Drug Administration in 2009 and by European Medicines Agency in 2010 for Schizophrenia and Bipolar Disorder treatment. Currently, many studies have been developed in an attempt to clarify and minimize the risks related to the use of psychotropic during pre/postnatal period on patients with a history of mental disorders.